Leslie Chambers reviews the Daiei 30cm Series Gyaos 1967 vinyl figure with blue fins by X-Plus which was released in 2016. • See more of Leslie’s reviews at his YouTube Channel. My first real episode of Kaiju Addicts TV is now available on Youtube. It’s a news video covering the new X-Plus announcements made this month. Special thanks to Rich Eso for doing the intro to this episode! Please help out my ratings by Liking the video and leaving a comment on Youtube. Today, X-Plus announced the Toho Large Monster Series “Shin Godzilla” vinyl figure. It will come in both Standard and Ric Boy Exclusive versions. 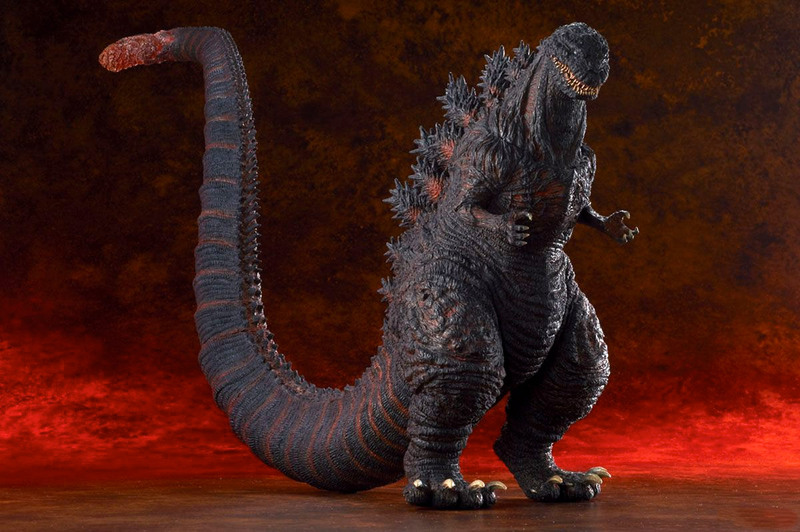 This new figure is based on the newest entry in the franchise, Shin Godzilla (シン・ゴジラ), or as it’s often called by its early, aborted name, Godzilla Resurgence. The news comes well after other brands like Bandai and Banpresto have already delivered. Let’s hope that this is a case of saving the best for last! 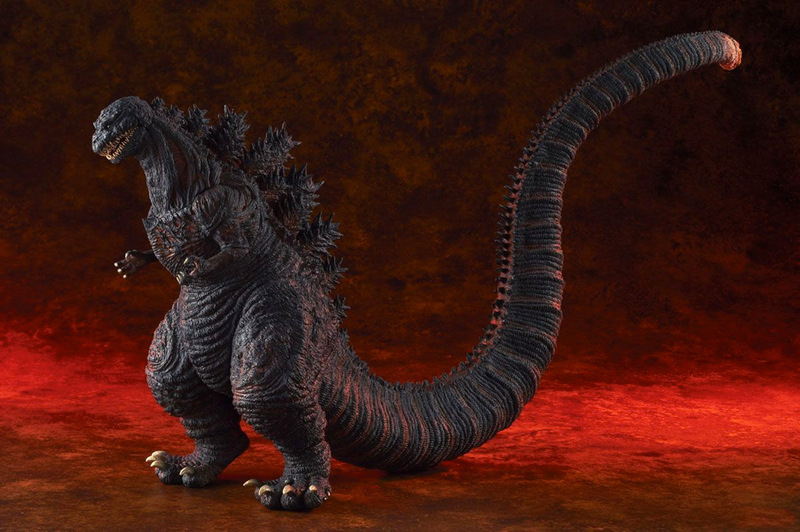 The upcoming Shin Godzilla vinyl will reportedly by 25cm (9.8 inches) tall from head to toe and 50cm (19.6 inches) from nose to tail. Although it’s technically the right height for a Large Monster Series figure, that bigass tail will give it more “presence”. As usual, the tail will come detached but is easily connected to the figure. According to the X-Plus site, the tail will be in one piece. But Gee Okamoto of X-Plus says it actually may be necessary for the tail to come in multiple pieces. The Standard Version will come with red paint details to replicate the fission glow from the movie. You can pre-order the Standard Version from the usual online Japanese retailers. Hobby Search has it for ¥17,982 (about $173 USD). Hobby Link Japan for ¥17,575 (about $169 USD). …did you catch that? Hobby Link is actually the cheaper route for a change! As of this writing, it has not appeared on AmiAmi.com yet. Keep checkin’. The release date for the Standard is late December 2016. You would think that Shin Godzilla and all his fission glows would be a perfect candidate for a light gimmick. Alas, X-Plus had other ideas. The Ric Boy limited edition will come with two interchangeable heads. One closed-mouth “regular head” (the same as the Standard version) and one “roaring head”. Since the lower jaw has separated at the chin, this “roaring head” is actually a silent, wide-open precursor to his ridiculously powerful atomic breath. There is no word on how and where the head joint will be. But I can tell you that the switch will have to made the same way that the tails are attached. It will NOT employ magnets like the Large Monster Series Leatherback does. The eyes on this alternate head are painted differently to replicate his protective eyelid membranes which closed right before he burned the city in one breath. On the Ric, the red highlights retreat on the neck, chest, spines and — especially — the tip of the tail to make way for violet, also to mimic Godzilla’s look when firing his atomic breath. You can pre-order the Ric Boy version at X-Plus’ online Ric Boy store. Caution: the site is in Japanese and you will need to pay up front in full. Also, they will not ship overseas so you will need a forwarding service like Tenso.com. The Ric Boy version will run you ¥19,980 (about $192 USD). Expected release for the Ric is late December / early January. 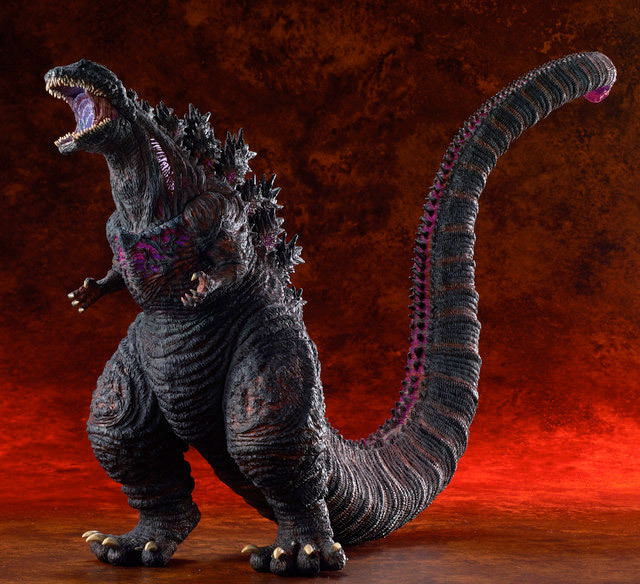 Demand for the Shin Godzilla 2016 Ric Boy has been so high, X-Plus had to move up the deadline to Oct.28. There were getting too many orders. They will open pre-orders for this figure Again sometime soon. Stay tuned for more information. • See the X-Plus page for the Ric Boy version of this figure. Way back in August 2014, X-Plus released the very first Showa Gamera entry into their larger line. The Daiei 30cm Series Gamera (1967) is from the 1967 film Gamera vs. Gyaos, the second Gamera film and the first to provide a giant foe, Gyaos. A 30cm Gyaos was later teased and promised. Years later, the big guy is ready to land on your shelf! 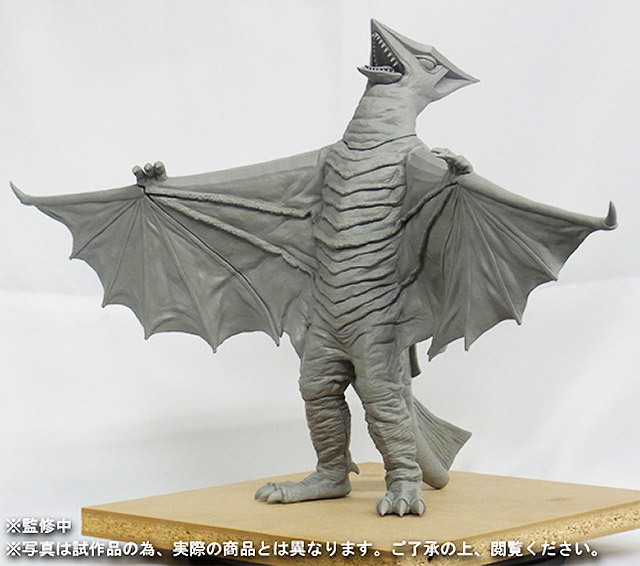 The Daiei 30cm Series Gyaos (1967) vinyl figure will be approximately 30cm (11.8 inches) tall. The figure is posed arching backward in mid roar with both wings spread. As usual, this is a very accurate sculpt carefully made to look just like the suit used in the movie. The Ric will come with a light gimmick which will illuminate the eyes, powered by a detachable ‘battery box’ requiring four AAA batteries. The Ric will cost ¥21,600 ($208 USD) and is available from X-Plus’ online Shounen Ric webstore. X-Plus mentions that there will be a Standard version (without the light gimmick). Keep checking Hobby Search, AmiAmi and Hobby Link Japan for details. Pre-order deadline for the Ric is mid-November. It is expected to ship in late December / early January. • See this figure on the X-Plus Ric Boy site. This year marks the 50th Anniversary of Ultraman. 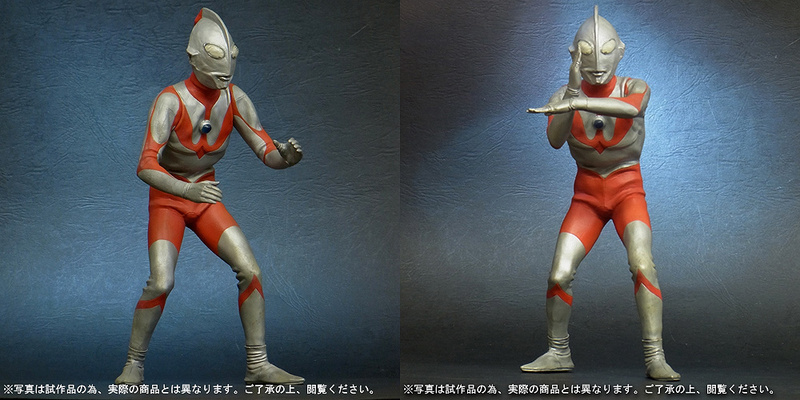 What better way to celebrate than with a new X-Plus Ultraman vinyl set? The new “Ultra Strategy” vinyl figure set from X-Plus comes with two previously released figures (reissues) combined to celebrate the very first episode of Tsuburaya‘s original Ultraman television series which aired in 1966-1967. The Large Monster Series Ultraman Type-A faithfully reproduces the original Type-A suit, complete with all its wrinkles, in one of suit actor Bin Furuya‘s signature poses. This is exactly how our hero looked in the very first episode. Bemular (or Bemura) is the very first kaiju foe to face any Ultraman and also appeared in the first episode. Of all the Ultra Kaiju created over the many years, Bemular is senior to them all. X-Plus had previously released both a Bemular vinyl and later a taller Bemular Reborn vinyl. The Reborn version is what you’ll get in this set. X-Plus states that both figures are “about 24cm” but that’s not quite accurate. I have both of the original releases right here in front of me. Ultraman is actually about 8.625 inches (21.9cm) tall. Bemular is 8.875 inches (22.5cm), a full quarter of an inch taller. While Bemular appears to be taller than Ultraman (as it should be), this is deceiving. If this Ultraman sculpt were to stand up straight, he would be the tall one. For some maddening reason, all of X-Plus’ Ultraman figures are taller than the bipedal kaiju which should beat him on height almost every time. 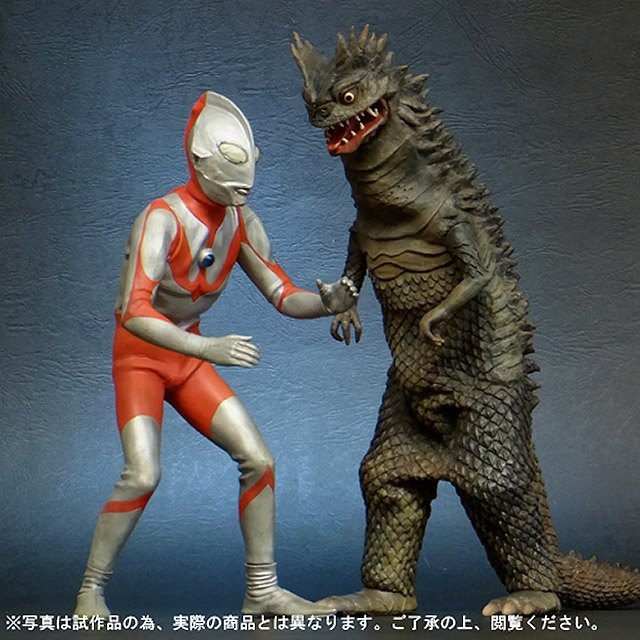 But, Ultraman’s crouched wrestling pose does bring him down in height visually and so these two do look great together on the shelf. Although this set bundles two reissues, there is something new and unique about them. The paint applications have been updated. A Google translation of the X-Plus Ric Boy page seems to indicate that Ultraman’s reds will now be redder. And photos of the Bemular prototype clearly show a brownish and greenish paint scheme as opposed to the original Reborn release’s brownish and reddish brownish palette. This set comes with both figures plus an optional stand for Ultraman. No assembly will be required. Although you may have to tweak Ultraman’s articulated ankle joints to get them positioned for proper balance. This Ric set will cost you ¥19,980 ($192 USD). It is available only from X-Plus’ Shounen Ric Webstore. This site is in Japanese and you will need to pay up front in full. Also, they will not ship overseas so you will need a forwarding service like Tenso.com. Collectors on Facebook can contact Mike Johnson for some help getting this set. • See more photos at X-Plus’ Ric Boy page for this set. Finally, X-Plus has left us with a tease for the upcoming Large Monster Series Pacific Rim Knifehead. More on that as the news comes in. See NEW post X-Plus Continues its Legendary Lineup with Pacific Rim Knifehead. • See High Resolution Photos of all of these figures at ScifiJapan.com. GodzillaFanFreaks reviews the X-Plus Daiei Large Monster Series Gyaos 1967 大怪獣シリーズ 大映特撮編 「ギャオス」 vinyl figure. See more videos at GodzillaFanFreaks Youtube Channel. Brutazilla reviews the X-Plus Large Monster Series (25cm) Gyaos. See more videos at Brutazilla’s Youtube Channel. See more videos like this at the PlasticOrResin YouTube Channel.